If Selma can be described in one word, it’s “fiery.” Biopics are typically such rote, thankless exercises in filmmaking that the idea anybody could make one colored with brushstrokes this passionate feels contrary. But there’s no better way to characterize what Ava DuVernay has accomplished in her dramatic chronicle of the 1965 voting rights marches than with flame. Selma burns brightly, succeeding where other films of its type fail by focusing on a moment rather than comporting itself like an origin story. DuVernay has chosen her moment and done it due justice. This is not the life story of Martin Luther King Jr. This is not MLK Begins, some cheap piece of hagiography disguised as a character study. No, Selma has purer intentions than that. DuVernay does away with the worst conventions of the biopic archetype from the film’s opening sequence, beginning her history lesson in media res and declining to hold her audience’s hand throughout the experience. She is operating under the expectation that we are at least passingly familiar with the events and the era she recreates in her film. Despite wisely choosing to limit her scope, DuVernay nonetheless has a lot of narrative to squeeze into the film’s two hour runtime (which, frankly, is probably the most standard thing about the whole production). She cannot waste precious minutes with clunky exposition. If you’re not sure that Alessandro Nivola is portraying John Doar, and if you don’t know who John Doar actually is, well, you’ll just have to look it up afterward because DuVernay doesn’t have time to wait for you to catch up. That, in part, is because DuVernay has somewhere to get to, but it’s also symptomatic of the film’s subject. If you’re making a movie about Martin Luther King Jr. (here embodied by the magnetic David Oyelowo, as much in spirit as in form, in one of the year’s truly great performances), then there should be no need to invent great, swelling proclamations to bolster your script. He made plenty of his own throughout his tragically short life, each as stirring, as blazing, and as genuine as all those preceding them. Trying to improve on his skill in allocution sounds like the definition of hubris. It turns out that copyright law is a harsh mistress; DuVernay and screenwriter Paul Webb couldn’t secure licensing on King’s speeches, and thus had no choice but to paraphrase. But their efforts successfully tap into the heart of King’s oratory gifts, filling in the margins between sermons with sparing dialogue far removed from the prototypically clunky Hollywood prestige parlance. The results sing. 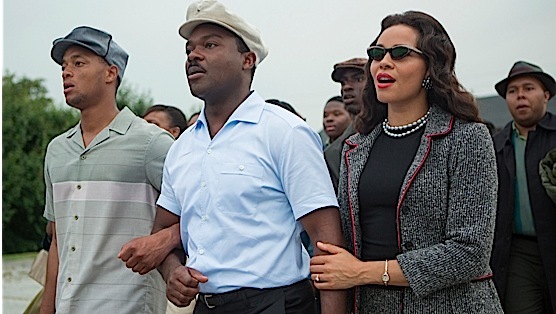 Equally important to Selma’s heart—perhaps more so—is the intelligence driving it. When undergoing similar true-story-fueled exercises in catching the attention of Oscar and his awards show fellows, the big studios usually ignore economy and embrace excess. But Selma remains focused rather than indulgent. DuVernay pays the respect due to the very real people who struggled and suffered to secure and defend the right to vote for blacks living in the American South. It may go without saying that among these figures, it’s King who stands the most towering, but even among a troupe so crowded as Selma’s, the supporting players (chief among them Wendell Pierce and Lorraine Toussaint, as well as Carmen Ejogo as Coretta Scott King, a perfect, simmering foil to the combustible Oyelowo) are as integral to the plot as King himself. That’s simply reality at play—King has become an avatar for the Civil Rights Movement, but he wasn’t the movement himself. Yet if Selma feels like a mirror held up to reflect the tensions of our own time, it’s only kismet. A shocking reenactment of Bloody Sunday, a televised display of wanton police brutality as well as a turning point in the voting rights campaign, echo the riots that have torn Ferguson apart since August, while other scenes may call to mind the suppressive violence exhibited on human beings in some of 2014’s other greatest hits. But DuVernay emphasizes positivism in the face of fear—fellowship really can conquer all ills—and in doing so makes Selma timeless rather than a relic. Editor’s Note: The third paragraph of this review was rewritten once to reflect the news that the filmmakers did not have access/rights to use MLK’s original speeches.